YOU CAN LIVE IN luxury at Pelican Pointe Villas. This luxurious condominium complex is only minutes from the Folly Beach shoreline and within easy driving distance of downtown Charleston, all of James Island and West Ashley. It-s close enough to the water for you to enjoy the salty ocean breezes, spectacular sunsets and marsh views but without the steep prices that come with oceanfront property. The Pelican Pointe Villas are affordable, but with quality workmanship and an array of features, they were built to last. A Hardi-plank exterior and hurricane glass windows offer extra protection against violent weather, as do pilings driven 66 feet deep to bedrock. 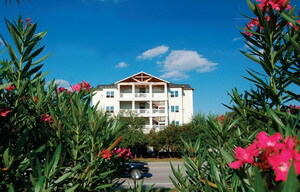 Pelican Pointe includes two buildings with three levels each, interior elevators and lots of parking. In the landscaped courtyard, which includes a gazebo, residents can enjoy the beautiful Lowcountry weather while lounging beside a sparkling pool. Inside each spacious two-bedroom, two-bathroom condo you will find a wide variety of features, often considered upgrades, that are standard at Pelican Pointe, such as granite counter tops, crown molding, hardwood floors, ceramic tile, stainless steel appliances, brushed nickel hardware on maple cabinetry, elegant lighting, either a deck or a sun room, and, in the master bathroom, a whirlpool tub surrounded by solid granite. Some of the 84 units even feature custom lighting and fan packages, tiled sun rooms and decks, vaulted cathedral ceilings, tray ceilings, custom color palettes, custom cabinetry and hardware, and covered parking under the building. All Pelican Pointe units were pre-sold and will be ready for occupancy near the end of 2006. However, with the final phases of construction underway, for a limited time, 28 units are back on the market for resale. Priced from $305,000 to $450,000, they won-t be available long. Cloice Janson, owner/broker of Janson Realty Home Sales Inc., exclusive listing agency for the Pelican Pointe Villas, says the development is "her pride and joy of many years spent in marketing." "While watching this treed land be cleared and pilings driven 66 feet down, I personally contracted six of these units myself," she says. "I invite everyone to take the drive down Folly Road to the beach and compare our stick-built construction with hurricane glass to all others along the road."